What is great about collecting baseball memorabilia is that one can either go back centuries to find what they are interested in up until the present day. While it may seem difficult trying to pick and choose which current baseball player will blossom, there are a select few that baseball collectors should pay attention to now and in the near future, as their values may rise dramatically. Here are five current hitters that should be on your radar if they are not already. At 29 years of age, Gonzalez has been one of the best hitters in the Major Leagues for some time now, but has been overshadowed by others such as Albert Pujols and Prince Fielder. Ever since his first full season in 2006, Gonzalez has amassed at least a .275 average, 25 home runs, 80 RBI’s, and 160 hits. In 2011 he moved over from the San Diego Padres to the Boston Red Sox, and performed ever better on the bigger stage. In 2011 Adrian had a .338 average, 213 hits, 27 home runs, and 117 RBI’s. He is one of those players that is quickly budding into a superstar and should be paid attention to very closely. One of the elite catchers in the game today, Joe Mauer had an off-year in 2011, and now would be a great time to check the market for memorabilia before it goes back up again. In eight full seasons in the Major Leagues Mauer has an amazing .323 average, three Gold Gloves, four Silver Slugger awards, and an AL MVP award in 2009. Justin Upton is only 24 years of age and still has great upside even though he has been in the league for four full years now. What makes him unique is that he has tremendous power to all areas of the field while also maintaining a good average to boot. In 2011 Upton had an average of .277, with 31 homeruns, 171 hits, and 88 RBI’s. He could certainly be at or near the 500 homerun club before all is said and done with his career, and as such it is a great time to think about collecting his memorabilia before he does so. Similar to Mauer, Ryan Zimmerman had an off-year in 2011 due to an injury, but he has certainly been one of the top third basemen in the league for a few years now. Zimmerman currently has a 162 game average of 25 home runs, a .290 average, 41 doubles, and 95 RBI’s in six full seasons with the Washington Nationals. As the Nationals continue to build their franchise with new ownership, his great numbers will only improve as better hitters are placed in the lineup to give him added protection. 2011 was a breakout season for Matt Kemp of the Los Angeles Dodgers, where he finished second in the MVP voting with a .324 average, 39 home runs, 126 RBI’s, and 195 hits. At 27 years of age, can he keep up the consistency that is needed for him to be a hall of famer of the next decade? What is great about Kemp’s future is that he prides himself on staying fit and has not had any serious injuries over his career to this point. It may be best to get in now on his memorabilia while it continues to rise, as it is likely that he will continue to build upon his 2011 season into the future. Whether you are a first time baseball card collector or a collector of many years, it is always important to know what the different types of baseball cards there are. There are so many different types of baseball cards out on the market today that it can be confusing when trying to distinguish one from another, so this guide will help you by giving a brief description of the main types of baseball cards to know about. Rookie cards have a pretty straightforward explanation, although it can be difficult sometimes to try to find this type of card. A rookie card is basically cards that are produced of a player’s first year in major league baseball. This can get somewhat complicated as a player may be called up to play for a couple of weeks at the end of a season or may get injured at the start of his real rookie season, so it is always best to check with price guides that mention which year is the rookie year of a particular player. This type of card is very popular to collect and many can be worth a great deal of money if they are of a famous player. This type of baseball card is a very popular option for those looking for a real challenge, or are looking to collect baseball cards over a period of time. Baseball card companies come out with complete sets of baseball cards; for instance Topps may come out with a card set for the year 2009. Sets can range from a few rare cards to well over 500 baseball cards, so there is certainly a wide selection for a collector to choose from. Common cards are baseball cards of players that are not very famous, or simply just everyday players. While they may be important for collectors who are trying to complete a card set or find players for a particular team, most collectors do not bother trying to collect them as they are very inexpensive and easy to find. A great alternative to consider is having your son or daughter collect these types of cards and send them to the players to get them autographed. Who knows, maybe the player on that common card could turn into a hall of famer! Game used cards are a lot thicker than regular baseball cards and contain a piece of something that was used in a ballgame by a player, such as a jersey, bat, or glove. These cards are usually hard to find and many collectors like to try to find them over a period of time, especially for the more popular players. Because of this, these types of cards can be very expensive to come across. Number cards are a rare type of card in which only a select number of them have been produced. When you look on the reverse side of a number card it will display two numbers (for instance 125/200). This means that you own the 125th card produced out of only 200 in existence. Obviously because of their limited production number cards can be worth a lot of money, but it can also be fun trying to collect as many of them as you can. Lastly, one of the most important types of baseball cards to know about are autograph cards. These types of cards come in two forms. The first is an official autograph card, in which the reverse of the card will have some guarantee stating that it is an authentic autograph card from the card company itself. The second is an unofficial autograph card, in which someone may have gotten the autograph at a ballgame, or some other scenario. It is important to be careful about collect the latter type of card as there is the risk of it being forged. Sending it to a grading company such as Beckett will help in validating the card’s authenticity. Here we have a really neat and inexpensive piece of baseball history, a Milwaukee Braves Baseball Pennant from the 1950’s. 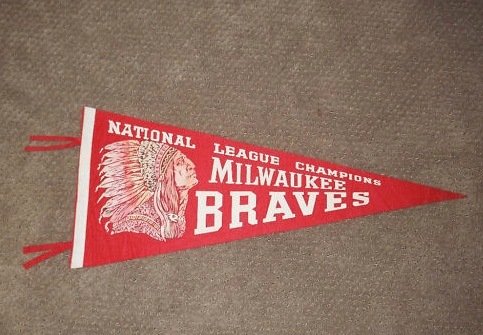 The pennant measures about 28″ by 12″ and is most likely from either 1957 or 1958, the years the Milwaukee Braves finished in first place in the National League. The white on red pennant is available for a buy it now price of $249. Take a look at some more vintage baseball pennants. Take a look at these seats that were removed and sold by United Housewrecking in the 1970’s during the renovation of Yankee Stadium. Although they didn’t include any certification the seller left them unpainted so you can see the layers of paint used by the Yankees throughout the years. They are in the same condition as they were the last time a fan sat in them. The seats have brackets so they sit as if in the Stadium. Don’t get these mixed up with the newer seats being sold as “Old Yankee Stadium Seats”. I’m sure people sat in these seats to watch Mickey Mantle, Roger Maris, and Joe Dimaggio. It’s also possible they watched Lou Gehrig and maybe even Babe Ruth. Of course they were there for people like Ted Williams and Willie Mays (World Series) too. They are available on eBay with a starting bid of just $1,490. 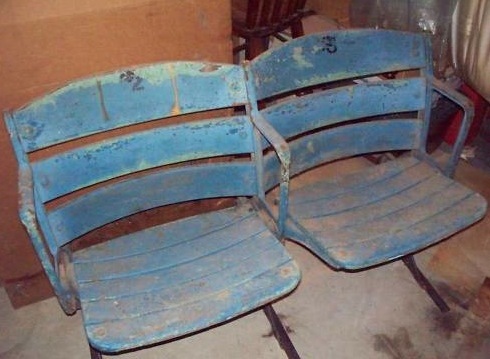 Take a look at some more vintage stadium seats for sale. 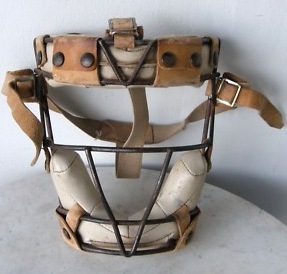 Take a look at this fabulous old catcher’s mask with leather straps, iron grid, and snap binding. Everything is intact: leather straps, leather padding, elastic headband, snaps, and iron grid. Great look! And wonderful gift for a baseball fan. Take a look at some more vintage catchers masks.